If you ever wanted to get a sense of what life actually felt like in camp, look no further than this contraband film from the Nobori family, shot inside Jerome, Arkansas. This 8mm “day in the life” was filmed by the father, George and leaves a time capsule so perfectly preserved for those of us who want to go beyond still pictures. The family’s candid footage reveals lightheartedness in a sober situation. It shows people making the best of their days amid dust, mess halls and rattlesnakes. George Nobori Sr. also took brilliant photos inside Jerome, all of which are in the piece below. I spoke with Larry Nobori, (the youngest son and baby in the stroller). Now 74 and living in Oregon, Larry is a versatile jazz musician who leads the Minidoka Swing Band. The band’s music pays homage to 1940s, Big Band era with songs that were played at Saturday night dances in camp, integral to keeping spirits up. Once a music teacher in Portland, he retired in 2001. The footage that we have is actually illegal. I was thinking it might be because even normal photography wasn’t allowed. Do you know how he was able to sneak it in? I don’t know. I don’t know what the circumstances were. I know that he showed it when we were kids. Don is our youngest brother and he’s the one that put it [the film] together. But we never did legalize the copyright, anybody can use it. It’s such a great video. The fact that it’s really long is fascinating because he took so much footage. Were you born after the camps? I was just born, George [brother] is a couple of years older than me. And so I was born in Sacramento because my family left the Bay Area to go to Florin because my dad thought that we wouldn’t be interned. So my mom was pregnant, we went up to Sacramento and then I was born. They were interned anyway. I guess Sacramento wasn’t far enough to avoid the camp. Were you only in Jerome or in other camps as well? ﻿We weren’t there that long. 6 to 8 months, or something like that. George has a better recollection. My dad wasn’t recruited in the 442nd so we as a young family were chosen to leave early. And so that gave us an opportunity to get out of there, then he started a new job with the family in Cleveland. Some people got out earlier depending on their ability to get work or stability. I think it’s individually different from family to family. There wasn’t a timeline where they were all released at once. Did your father ever speak about his experience? He didn’t talk about it, we didn’t ask too many questions. We were, to my knowledge, a kind of news item in the news reels that used to be in theaters in-between shows. And so my dentist from when we lived in the Bay Area, Dr. Fuji, said, “I want you to see these films I have on internment.” And he’s showing us these films and it’s our family going to Cleveland, released from camp going out into the private sector. And so my dad got a job. I think he worked in a government job in the beginning and then he started to work in the auto business. I don’t know too many specifics but that’s how we ended up in Cleveland. Have you shown that video to museums or do any archives places have it? My brother Don had my dad’s camera and film. And after my dad had passed, Don brought it to Costco to have it put on a DVD. 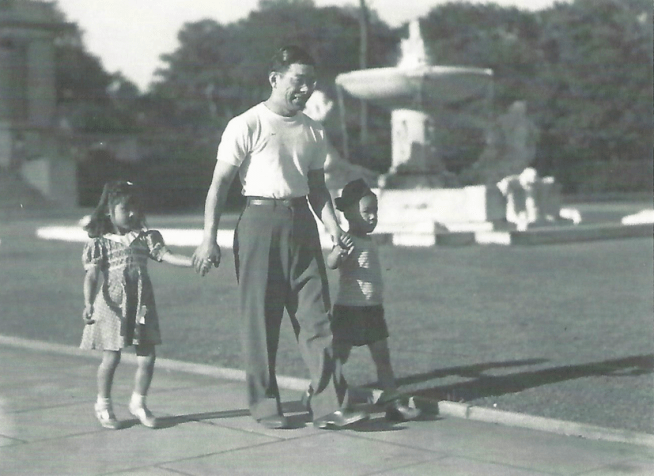 It was part of a collection of film footage of our family before, during, and after internment. My brother, George Nobori Jr., help start the SF Bay Area J-Town Jazz Band, with noted author/musician George Yoshida, who wrote the book Reminiscing in Swingtime. I similarly was asked to direct a youth group called the Minidoka Swing Band to present the music and dance of the internment era. In October 2007, we made a pilgrimage to Minidoka. Wall Street Journal reporter Joel Millman took an interest in the band and wrote a front page article in the WSJ. What does the band play specifically? Mainly swing, Glen Miller type stuff. We went up to Minidoka, presented the band, that’s part of it. Then the band kept on going after this pilgrimage because we wanted to bring young people up to Minidoka to show them what that was, you know, Japanese, Asian youth. So then it kept going and we as a band became more of an adult band and kept performing under the Minidoka Swing Band title. Later I collaborated with Lawson Inada who was the poet laureate in Oregon and made up a jazz ensemble featuring his poetry and storytelling. Our trumpet player’s father, Ben Homer, wrote “Sentimental Journey.” We set up a series of concerts where I would play “Mood Indigo,” to his poetry called “Mood On The Go”, a poem about my life. This was the predecessor to my playing of “Mood Indigo” along with the family video. We did several performances, including Lewis and Clark University, Willamette University, Unitarian Church (Portland), Hood River, The Old Church, and a few others. Then we showed the video of our family interned in Jerome. I played “Mood Indigo” which is about four minutes, 30 seconds. It’s written by Duke Ellington and it’s the bluest of blue, so it’s a very sad song. Another person in the band, Nola, sang “Embraceable You” which is a song representing a lack of intimacy in the camp, no privacy. And she experienced that. Later on she did “Tuxedo Junction,” which is the train leaving the internment camps and going home. So we used musical themes to present this program about internment and that’s how the video was used. And we went to Japan and played. During our Japan Tour in November 2015, I helped design a presentation which would tell the story through video, personal experiences, and music. Four of us had been interned: Henry ‘Shig’ Sakamoto (Minidoka), Nola Sugai Bolge (Minidoka), Lawrence ‘Larry’ Nobori (Jerome), and my brother George Nobori (Jerome). Todd and Elaine Yuzurhia were not interned but Elaine’s father was a no-no boy. And so each of us were assigned a piece to describe a part of internment. “Sentimental Journey.” Written by the father of our lead trumpet Rick Homer, “Moonlight Serenade” (youth and dance), “Blue Skies” (the war is over). “Embraceable You” (lack of intimacy), “Tuxedo Junction” (Denver Station and leaving the camps). We did full performances in Fujisawa, Tokyo, Minamisoma, and Gotemba. The committee that gave us our grant evaluated our performance to determine how much of the grant they would give us. We received a 100% of the grant plus an offer to come back and perform in Hiroshima, Osaka, Kyoto. Do you play several instruments? I play mostly saxophone and clarinet. I actually played classical clarinet when I was living in the Bay Area but I moved up here and I switched to jazz. I never made it into the big time like the symphony or anything like that. I decided to teach school and I taught for about eight years in Berkeley. We came up here in ’78. And that’s when I decided that no one knows who I am, so I thought I was just going to practice and play jazz. Is the Minidoka Swing Band still performing? The grant committee offered us the possibility of doing another tour, which would be in three to four years. It is unlikely that Shig and Nola would be able to do another tour in that time. We’ve got four concerts this month already, including New Year’s Eve. And Nola said, “I can’t do this anymore, I’m worn out.” And she’s older than me, and her voice is not the same. She’s just worn out and even though I don’t think so, that’s her decision. And this was just a couple of days ago. I may be the last link to internment camps in the Minidoka Swing Band. As the director, I will continue to perform with the remaining members of the band. After Larry’s parents left camp, they resettled in Cleveland. Here they are pictured in August 1943, in their new neighborhood.